“How to remove oil stains?” is a common question to those persons who use carpet at their home. In our daily life, we use oil in many works. Sometimes oil falls into the carpet and appear oil stains on the carpet. Fortunately, oil is not permanent and it can be removed easily. Everyone doesn’t know how to remove oil stains from carpet. For this reason, they search for oil removing carpet cleaning tips. Today I am going to write an oil stain removing guide. With it, you can remove oil from carpet easily. First of all, remove oil from carpet as much as you can with a normal paper or absorbent clothes. If you want to use newspaper, then don’t use the print side too long. Otherwise, the print letters will be glued with the carpet. Once a majority of the oil has been removed, cover it with cornstarch or baby powder. Brush it over lightly so that it can work into the fibers. It will soak up the oil from the fibers. Leave the cornstarch or baby powder there for at least one hour. Then vacuum the area to remove cornstarch or powder from there. Now you are ready to remove the last bit of the oil from the carpet. Put a small amount of dish detergent. Scrub with a toothbrush to work into the fibers. Now you need to remove the dish detergent from there. It’s very time consuming because if a small amount of detergent get water, it suds up. So, put there little bit of water from your water bucket and blot up with a sponge or soft cloth. Continue this process until the detergent get out. When the detergent completely gets removed, use a towel to soak up the extra water. Now leave the area to dry completely. You can easily remove oil from carpets by this carpet cleaning tips. These tips remove oil from carpet as well as the oil stain. 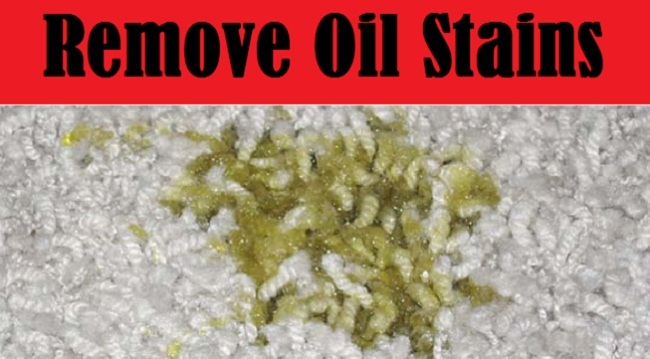 Now you have got the answer of this question – how to remove oil stains? After finishing the process, use fan or vacuum cleaner to dry the area soon. If you need extra cleaning power, then mix vinegar wit the dish detergent. So if you are seeking for removing oil stains from carpet, you can go through with this process. It is easy and effective way to remove oil stains from carpet.